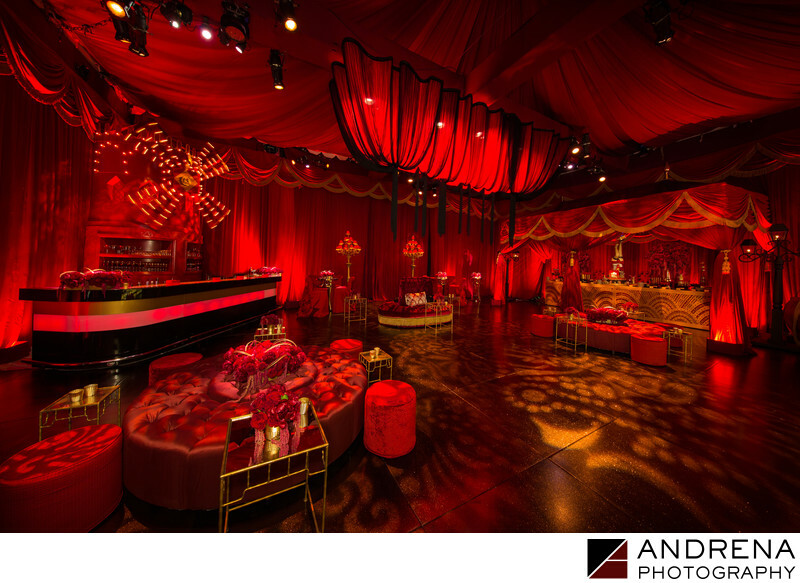 Photographing a red on red Moulin Rouge ballroom is no easy feat, but when working with top design talent, such as Sonia Sharma Events and Revelry Event Designers, you can't have any excuses. For this stunning image, I used Canon's new behemoth 11-24 lens and a tripod. Images by Lighting ensured that the lighting in this red room was just perfect to the eye, but where cameras are concerned, photographers need to help the existing lighting out by adding their own lights. A combination of multiple exposures and light painting contributed to creating this perfect image. From the dessert tent on the far right to the spinning windmill bar on the far left, every element of this room deserved to be captured in the final image. Thankfully, the 11-24 helped me include every major element in this setup. I'm delighted that Grace Ormonde Wedding Style magazine chose to run this image over two full pages in its Spring/Summer 2016 issue.